A leader of a dissident Farc rebel group has been killed in the Colombian province of Guaviare, the country's ministry of defence has announced. The man, who used the alias Euclides Mora, was kicked out of the Farc last December with four other rebel leaders for not agreeing to the terms of the peace agreement signed by the group. The military said he had been engaging in drug trafficking. He was killed in an air force operation in the jungle. President Juan Manuel Santos wrote on Twitter that the killing sent a clear message to any remaining rogue Farc members: "Hand yourselves in or you'll face prison or a grave." The Farc signed a peace deal with the government in November 2016 after 52 years of armed conflict. But a small group of Farc members did not accept the peace deal and stayed in the jungle while the Farc rebels gathered in "transition zones" to disarm. The Farc announced in December that they had severed their ties with four of the renegade rebels, including Euclides Mora. The dissident rebel groups are active in the provinces of Guaviare, Guainía y Vichada as well as Nariño. It is not clear exactly how many dissident rebels there are but the military said Euclides Mora led a group of 25 fighters. They blame him and his renegades for much of the criminal activities in the area, including extortion, the recruitment of minors and cocaine production and smuggling. 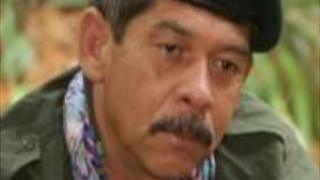 Before being kicked out of the Farc, Euclides Mora was one of the rebel group's most feared fighters. He is thought to have joined the group in 1998 and is accused of taking part in some of the bloodiest attacks on Colombian security forces such as the attack on the police counter-narcotics base in Miraflores and the military post in Mitú.